I have so many conflicting feelings about these massive, big-budget projects that require huge teams to make finally taking the “risk” on including canonical queerness … even if those stories end in death. But I’ll open it up to the two of you. How did you feel about these announcements? Anyone else on an emotional roller coaster about what we even want from these games, and what we get? Maddy: I think part of the work that we’ve seen happen, which is some very by-the-books queer romance between thin white people, doesn’t feel just tokenizing but… safe? The least “objectionable” queer content. And it is also something we are supposed to feel “thankful” for, so there is always a part of me that feels some guilt for wanting more or different things. Maddy: I got my “bah humbug” out as well, but I did like the narrative structure of the kiss in the trailer, which seems to have been lost on a lot of people. Ellie’s line, “I’m just a girl, not a threat” is a reference to her assumption that men will angle for Dina’s affection, and she won’t be able to “compete” with them, since presumably Dina is straight. It’s a sentiment that’s grounded in heteronormative gendered assumptions (women can’t ever be a sexual “threat”… a lot to unpack, there). To juxtapose that with Ellie proving she can also be a “threat” in a very different sense (killin’ some baddies) serves to underscore her methods of survival across multiple fronts. There are, perhaps, some interesting ideas in there about the queer experience, but maybe I’m just saying that because I’ve watched Hayley Kiyoko’s “Girls Like Girls” video too many times. It also has a narrative of queer smooches and protecting yourself from violence (in that video, it’s explicitly about a hate crime). Maddy: Yeah… it’s like, queerness both matters more than anything and also is something that I desperately want to see as mundane and un-special. It’s hard to explain what it’s like to have those two sentiments dueling in my head at all times, so just imagine Ken and Ryu really going at it. Anyway, I just want to say thanks again to both of you and to Gita for participating in our own little Pride Week. 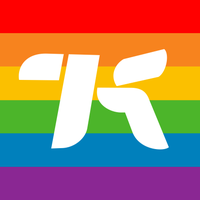 Whether we’re writing silly posts about characters that we ship, or serious ones about characters that we just want to see live, or any sort of coverage about the queer people who work in games or play them … we’re doing those things while also being queer. And that informs who I am, even when it’s not in a footer at the bottom of a post. It both doesn’t matter and does matter to me, all the time. That’s why I wanted to do this thing. Anyway, thanks. Maddy: Hellllll yeah. I’m gonna miss the rainbow logos. But maybe they’ll be back again… next year!